Thanks to unique spatial resolution analytical capabilities (subnanometer lateral and depth resolution), the CAMECA Atom Probes perform benchmark atomic scale quantitative analysis in materials. In the present study, the LEAP Atom Probe was used to investigate the phase separation process in Ge15Sb85, a material used in optical as well as electronic data storage devices. 2 analyses were performed: one on a as-deposited sample (left side), the second one on an annealed sample (right side). 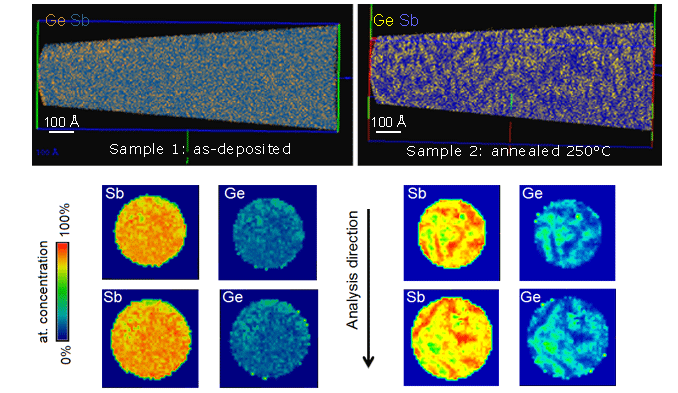 While the distribution of Ge and Sb atoms is homogeneous on the 3D mapping of the as-deposited sample (top left), Ge-enriched areas are clearly visible on the 3D reconstruction of the annealed sample (top right right). Data comparison between the 2 samples reveals the nanoscale phase separation occurring during heat treatment. By extracting a 1nm-thick slice in the perpendicular direction and using false color on the quantitative atomic concentration scale from the nanovolume, one provides even clearer evidence of the phase separation. Note that the size of the phase separation is only few nm.